Sermon: Who is Your Samaritan? My friend Mary was born in Indiana and moved to Israel 20 years ago with her three young children. She loves Israel, every narrow gate and cobbled street, the sticky pomegranate juice sold from a stand in the suq, the sweet olive trees abloom on the rocky hills, the donkey cart bouncing down a bumpy village path. She stops to watch the Orthodox Jews with their black suits and black hats davening during their prayers at the Western Wall. She falls silent when she hears the call to prayer sweeping down from the Mosque five times a day. Indiana was a different world, a different life. But two years ago, at the start of the second intifada, she was ready to leave. Like many Israelis, she was afraid – no, terrified, terrorized. Every day she lived with fear. She was afraid to travel on the road from Jerusalem to Jericho. When her older son was nine, on a class trip to Tulkarem, a bus was blown up before his eyes. Her daughter left a café just moments before a bomb exploded. Watching the news was difficult. Are my children safe? Did any of my friends get killed today? Once she saw her younger son, then a soldier, on the evening news and wept. She told me that she took it personally. It wasn’t just that her world was unsafe. She felt that these Palestinians wanted to kill her, Mary. That they hated her, Mary. And she started to hate in return. She hated hating. As I said, she though of leaving, of returning to the safety of America. She thought of staying, of continuing to live with her fear. Both choices made her sad. Then she had an inspiration. She would go to the West Bank and meet Palestinians. If they really wanted to kill her she would make it easy for them. She would get it over with. If she was wrong – well, let’s see what would happen. She asked a friend for an introduction. She crossed a checkpoint into the Occupied West Bank. She held her breath. Would they slam the door? Throw rocks at her? Did they keep a bomb in the cupboard just in case some crazy red haired Jewish lady came to their door? She held their children on her lap. She hugged them back. Since then, Mary has made many Palestinian friends. While we were in Jerusalem she had a birthday and celebrated it with what she calls her “Hebron family.” When we had lunch in Abu Dis she disappeared into the kitchen to help with the dishes. She is no longer afraid. She no longer hates. But her world is no safer. She still has a son, her youngest, in the Army. Her daughter still hangs out at cafes. She still holds her breath when she watches the news. No, her world has not changed. She changed. While traveling on the road from Jerusalem to Jericho, from Israel to the West Bank she decided to love her neighbor as herself. And she disappeared fear. When Jesus talked about the road from Jerusalem to Jericho everyone knew what he meant. They called it the bloody highway. A violent place, a dangerous place, not a place to be caught at night. We know places like that. Places that when you drive through you hold your breath and lock your car doors. Places your mama told you not to go, places where you have no business being. And when Jesus talked about the Samaritan everyone knew what he meant. Our enemies. The Bad guys. Heretics. I bet the people in the crowd thought at first that that nasty Samaritan was going to pick the traveler’s pocket then kick him in the ribs for good measure. To stop by the side of the road and help someone in trouble was more than being nice, more than taking pity or having mercy. It was putting your own life in danger. 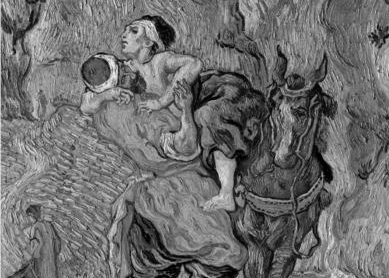 The Samaritan was the person least likely to do it. But he did. It was shocking to the crowd, I’m sure, to have the hero of the story be a Samaritan. And we come away from this story knowing that if we want eternal life we need to do the hard thing, to love our neighbor as much as we love our self, to have pity, to show mercy, even when it is inconvenient, even when it costs money, when it makes us late for a meeting, even when it puts our own life in danger. This is what Mary did. She wanted life, a life, a life liberated from fear and its twin, hatred. And to do that she had claim her place as a neighbor, cross the road as a neighbor, have mercy, have pity, do her duty as a neighbor. The eternal life that Jesus speaks of isn’t only life in heaven. It’s life here on earth; a life lived in the presence of God, in the company of God, with the awareness of God. This love your neighbor stuff isn’t a mystical formula, its practical advice. Jesus is saying, if you want to live, really live, here’s a technique that works. If you want to save money, spend less than you make. If you want to lose weight, eat less, exercise more. If you want to live, love your neighbor. It seems to work – think of that Samaritan who stopped on the road. There is no Samaria now. We would now call parts of that ancient land Israel, parts of it Palestine, or the West Bank. But Samaria lives on; it has eternal life through the often told story of that one good Samaritan, that man who called everyone his neighbor. The lawyer asked, who is my neighbor? What answer do you think he expected to get? I think he was hoping for a narrow answer, an answer that would confirm his hunch that he was on track for this eternal life. Your neighbors are the people who live on your street, in this neighborhood, in my town. Yeah, I can love them. But no. Jesus did not define neighbor-ness by geography. It’s a big world, he said, but we all have the capacity to be neighbors. Even a Samaritan, that strange guy that lives a few days journey away from here, he is our neighbor, we are his neighbor. Now, what is interesting here is that Jesus is not defining neighbor-ness by the other. He’s defining it in terms of ourselves. People become our neighbors when we dare to come close enough to see their pain, to notice their need. Once we know that about someone – that they need our help – then they become our neighbor. So when the lawyer asked for an explanation he had the question tossed back to him. The definition of a neighbor is up to you. Are you willing to open your eyes to the pain of others? How much mercy can you show to those in need? Jesus wasn’t about to draw a circle and say, inside the circle – neighbor. Outside the circle – forget about him. Anyone can fall inside our circle. I would have liked to have talked to that lawyer after Jesus was done with his explanation. I bet he was looking for loopholes. Jesus wasn’t giving him any. There really was a Samaria once. I want to fix in your mind the map of the Holy Land that would have been familiar to Jesus. In the south was Judea, from the River Jordan to the Mediterranean. Jerusalem is in Judea, as is Jericho. So is Bethlehem. In the lower left corner is the Gaza Strip, then called the land of the Philistines, part of Judea in Jesus’ time. Next up was Samaria, also extending from the river to the sea. Here you will find Ququilya, Jenin, Tulkarem, where Mary’s son saw the bus explode. Nablus, the biggest city, is about 40 miles north of Jerusalem. And in the north is Galilee, Nazareth. Today, some of this is Israel; some of it is Palestine – the occupied West Bank, the West Bank of the Jordan River. Some of it is still disputed. I’m still in the first thousand years in my effort to understand. Just a beginner. But I’ll try to answer my question: who are the Samaritans today? For Mary, the Palestinians were her Samaritans. These were the people, she thought, who wanted to kill her. The people who blew up buses in front of her young son, who gave her sleepless nights. Palestinianterrorists. One word. She didn’t know any Palestinians. Oh, she maybe handed money over to a Palestinian shopkeeper or saw them in the fields during the olive harvest. But she had never been in a Palestinian home, never had a conversation with a Palestinian. To many Palestinians, the Israeli Jews are their Samaritans. Their soldiers man the checkpoints. They build walls that separate mother and son, enforce curfews, deny permits, bring bulldozers to demolish houses. They can make life miserable, unbearable. I found it strange that Palestinians and Israelis, Arabs and Jews, live side by side but are often blind to each other’s pain. Most have chosen to see each others as non-neighbors. Most have chosen to see each other as bad Samaritans. Boy, was I wrong. We entered through a different door, into the Ibrahaim Mosque. Same building, same tomb, same Abraham. Just a different door. The Israelis and Palestinians do this all the time: go to the same place but enter by different doors. Last month I spend a few weeks in Israel and Palestine on a peacemaking study tour. I went wanting to be a good neighbor but wasn’t sure what that meant. So I listened. And was exactly the right thing to do. What everyone needed, the oil and wine to cleanse their wounds, was for someone to listen. To both of them, Palestinians and Israelis, we Americans were Samaritans, in a sense. They were surprised and pleased that we had crossed the ocean to be with them on their painful journeys. As we become neighbors, the personal often becomes political. My friend Mary learned this, too. As she became friends with this woman and that family, as she became a familiar face in this town and that village, she knew that part of being a good neighbor was not just in binding the wounds but also in making the road safe. Not just safe for her, but safe for everyone. This being a good Samaritan is more complicated than I thought it would be. To hold God and humanity in one thought, at all times, in all places.